During the late Renaissance, Venice replaced Florence as Italy’s most celebrated art capital. “In the Age of Giorgione” at London’s Royal Academy of Arts explores how this came about thanks to two local talents, Giorgione and Titian (March 12 to June 5). Organized thematically, the focused survey begins with two galleries of portraits, followed by landscapes and religious paintings. Rare masterpieces by Giorgione are displayed alongside early works by his younger colleague and rival Titian, and two paintings by their teacher, Giovanni Bellini. After Giorgione’s untimely death, it was Titian who put Venice on the map. In his Lives of the Artists, Giorgio Vasari describes Giorgione as “extremely fond of the lute” and “a very amorous man.” Little else is known about this enigmatic figure, whose life was cut short at age 32 by the plague. Still, his highly atmospheric, poetic landscapes and psychological portraits influenced a generation of Venetians, including Titian. The short-lived painter didn’t sign his works, leading to continued debate over the authorship of some three dozen paintings. 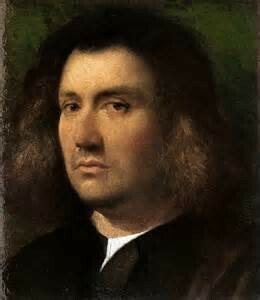 Over the centuries, as Giorgione’s legend grew, his works were regularly mistaken for those of Titian and others. In 1772, Russia’s Catherine the Great thought she’d acquired Raphael’s poetic painting of the biblical heroine Judith. The Hermitage masterwork was later reattributed to Giorgione. Today, scholars agree on the attribution of just a handful of Giorgione works. “In the Age of Giorgione” opens with one of these, the Terris Portrait, named for a former owner, Scottish coal merchant Alexander Terris. Because of the sitter’s mysterious expression, the Terris Portrait has been called San Diego’s Mona Lisa. In 1499, at the start of Giorgione’s career, Leonardo da Vinci did stop briefly in Venice. Though it’s not known if the two artists actually met, Giorgione appears to have taken a technical cue from Leonardo. “Giorgione applied thin layers one on top of the other, creating subtle gradations of light and shade, reminiscent of Leonardo,” says exhibition curator Per Rumberg. When the Putnam sisters of San Diego donated the small, closely cropped picture to the San Diego Museum of Art in 1941, it was thought to be a self-portrait of the artist. An early 16th century inscription on the back of the panel scribbled in ink either by Giorgione or his patron reads ‘by the hand of Giorgione of Castelfranco, 1506.’ Recently, infrared reflectography also revealed a pastoral scene with three figures on the back. Giorgione’s dreamy landscape, Il Tramonto (The Sunset), also remains shrouded in mystery. The figure of Saint George on horseback slaying a dragon was added in 1934 to mask damage to the canvas. Against the dusky setting, an older bearded man checks a younger man’s leg – a possible reference to the Good Samaritan or the Greek myth of Philoctetes. The identity of the young Venetian noble who meets our gaze in the Giustiniani Portrait is also unknown. The shy sitter in the unlaced violet doublet with his right hand on a parapet is currently attributed to Giorgione, but experts disagree. To cast your vote for Giorgione, Titian, or neither, visit https://www.royalacademy.org.uk/article/giorgione-titian-portrait-debate.